It’s time to put your linguistic skills to the test once more, as your talents as a wordsmith are your only means to survive against the monsters, ghosts, and evil bunnies that Grimm is confronted with as he wanders towards the closest pizza place to satisfy his hunger. Letter Quest Remastered is a game that has already been released on many platforms (even the neglected Wii U), but has now come to Nintendo Switch and presents the chance to boggle your mind. This part puzzler, part turn-based RPG never fails to entertain and has been built around a differentiated challenge in which it is the lexicon that your brain has accumulated over many years that will determine whether you succeed or not. That’s because you must spell words using the letter tiles that you are handed in each stage to defeat the otherworldly beings that, for whatever reason, want to prevent you from buying pizza. The letter tiles that you want to use in Letter Quest Remastered don’t have to sit beside each other, meaning that, for those that have played it before, constructing words from the jumbled tiles soon sees the experience start to feel similar to Boggle. Except in this game, once you have correctly created a word it is highlighted in blue – at which point you can choose to use the word to attack with your scythe or to continue to lengthen the word. The longer the word, the greater the damage that is dealt to your enemy, and, as with Scrabble, some rarer letters carry more points that you should always look to use on tougher enemies. But, tiles can become cracked when you take damage meaning that it won’t deal any damage if used in a word, become plagued that will soon spread between tiles, and can be poisoned, which will harm Grimm when used. It’s worth removing these from the play area as soon as you have the chance, although it can be hard to do so if they are an awkward letter. It isn’t long before you will come across a pile of gems to retrieve, and you are showered with these as you complete quests that you are randomly given. These can usually be completed without paying much attention to them, whether that be spelling a specific number of words, defeating monsters, or earning gems. If you come across the merchant in a level, the gems that you gather can be used to buy potions that can temporarily reduce damage taken, restore health, or increase your damage output. It’s more practical to save them for the Upgrade Shop on the map screen, where the game’s RPG mechanics whir to soon see you permanently increasing Grimm’s health, the damage his scythe can deal, or wearing more armour to reduce the damage taken from a monster’s fumbling attacks. There are also new weapons to unlock, and Rose as an alternate character who saw Grimm’s “Help Wanted” poster and immediately quit her job as a barista. While the Story mode in Letter Quest Remastered has some 40 stages to wade through, the game’s replay value comes in returning to those that you have already conquered to try to collect the time trial and challenge stars. That, unsurprisingly, throws in a time limit or can directly challenge your vocabulary to complete the stage using only a certain number of words or letters. 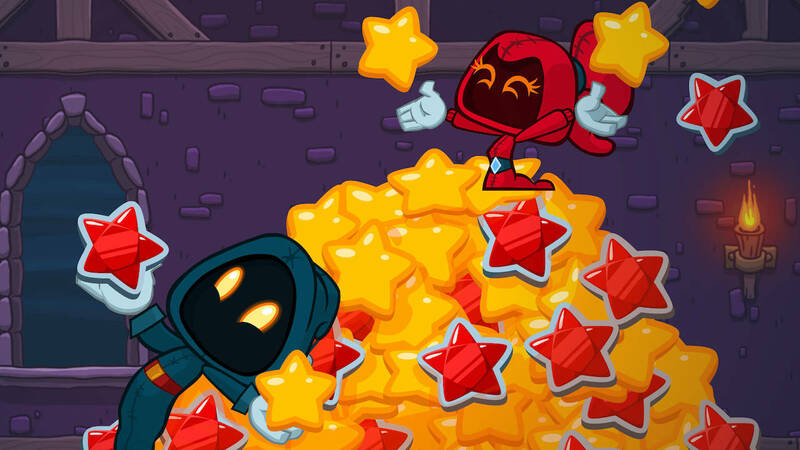 That leads to opportunity to tackle the “ultra-tough” Crystal Star, which are the moments in which Letter Quest Remastered is at its most difficult. There’s an Endless mode as another distraction as somewhere where you can chase high scores, but, personally speaking, I preferred chasing more stars in Story mode as a way to sink more time into the game. I did seem to have some button input lag when selecting tiles with the Nintendo Switch Pro Controller, but, for those that are looking to play this in Handheld mode (which it is more than a perfect fit for) then using touchscreen controls is easily the best way to play. Grimm may earn himself one too many slices of pizza for your efforts at wordplay, but Letter Quest Remastered doesn’t have enough content to really satiate my appetite. That’s a compliment in many ways, a game that has a clever gameplay mechanic but just needs to find more ways to explore it.